Start a new chapter with Ever After High, where the teenage sons and daughters of famous fairytales decide whether or not to follow in their parents’ fabled footsteps. Ginger Breadhouse, daughter of the Candy Witch of Hansel and Gretel, has chosen to rewrite her destiny as an Ever After Rebel -- and to do it in storied style. 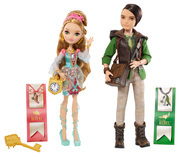 Fans of Ever After High will recognize her iconic everyday outfit from the webisodes. Happier making dessert for others rather than eating them for dessert, Ginger Breadhouse doll is sweetly enchanting in a spelltacular dress with candy colors, a sprinkle-inspired print, sheer yellow overlay and chef-inspired jacket. Candied jewelry, pink eyeglasses and frosting-decorated shoes look good enough to eat. A cauldron-shaped handbag and cupcake-decorated headband are the icing on the cake! Capture all of her poses using the doll stand. Doll also comes with a bookmark that shares her hexclusive story and a doll hairbrush. Collect all of the spellbinding students of Ever After High (sold separately) for hexquisite display and storytelling fun. Doll cannot stand alone.